Raised Toilet Seat Deluxe Carex 500 lb. Wt. Cap. 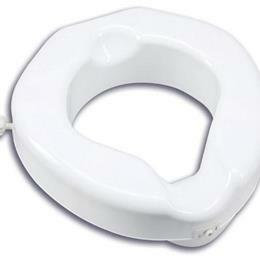 The Raised Toilet Seat adds 4.25" of height to your toilet with our Safe Lock raised toilet seat. This seat locks in place in seconds and is perfect for those with bending difficulties. The Safe Lock Raised Toilet Seat features a wider opening and smooth contoured design for added comfort. This seat is easy to clean and fits most toilets. The Safe Lock system locks the seat into place for security and stability. Product Dimensions: 4.25" x 14.5" x 16.63"
Package Dimensions: 17" x 16.75" x 4.5"